Hi...it's Windhorse, and I have done something unusual...what else is new? I've taken the liberty of copying my former pack sister Algiz' pages about wolves. She did such a great job, with so much information~and now the pages have been taken over and who knows where Mary went? If you see this, Mary...say hello! (I have written you an email at the address you had here.) With respect I have left your work intact...it needs to be shared. I'll remove it if you have redone it elsewhere on the web, and I would ask that I may link to it again. Our precious wolves are still under attack. A place dedicated those of us who strive to protect these beautiful beasts. Hi everybody and thank you for visiting my den. It is kind of small but I am still moving in. My name is Mary, but in here I am known as Algiz. I took my name from the ancient Norse rune meaning Protection or Protector. I thought it was only fitting since I want to protect and preserve these hauntingly beautiful creatures that I should take a name explaining what I want to do. If you want to learn more about me then visit my homepage, because in here I want to leave myself behind and hopefully open someones eyes to the unjust way that wolves are treated. I have felt a kinship with the wolf ever since I was a small child. I shall never forget the first time I saw one of these majestic creatures. My family was visiting Yellowstone Nat. Park, we were walking along a trail and I saw 3 wolves. I pointed them out to my father and we stopped to watch them. As they were walking away, the last one turned to look at us. We were all so perfectly still, we even held our breaths. The eyes of that wolf were so intelligent and beautiful made me wish that I could be one. Ever since that day, I have always loved the wolf. As I got older and I learned of the peril that these wonderful creatures are in, I decided to try to do my part to help them make a comeback and to protect them from further harm. This page is just another way that I am trying to help. I want to at least try to inform people that these as well as many other wonderful creatures are being destroyed every day, just because they are in our way. So please read on and learn some of the atrocities that some humans are doing how some of us are fighting back. in many different ways. These pages are about communication among wolves. Have you ever noticed that when one begins to bark, all of the dogs around it start to bark too? Barking, growling, and whining are some vocal ways that dogs, and their wild counterparts, wolves, communicate. But they also communicate with body language and scent. A lot of research has been done about wolves and the way that they communicate their,feelings and needs to other wolves. They use their sense of smell to communicate by "marking" territory the way dogs do, and by scratching the ground which may leave a scent if glands that are located in the feet are stimulated. The scent markers may have many different functions. They tell intruders that they are entering territory that belongs to another pack, or tell members of a pack that they are still inside their territory. They may also help a lost member find home or help a pack locate a lone wolf. Wolves also identify each other by their individual scents. They often "scent role" by rubbing their fur on an object and thus transferring the scent to another place. Wolves also howl and make plenty of other verbal noises to communicate. The growl, bark, yip and whine much like the family pet dog will, and for many of the same reasons. So since everybody can pretty much figure out why a wolf would growl or bark I am going to concentrate on howling. Just before a howl, a wolf often whines and wags its tail. It may then lift its head and open its mouth and let out a long howl. 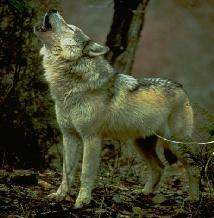 Considerable tail wagging, excitement, and general friendliness usually accompany the howling. After a pack wolves ends the howling session, there appears to be a period of fifteen to twenty minutes or more during which wolves will not howl. This is called a "refractory" period. Researchers have come to the conclusion that wolves howl for mainly 4 reasons. Wolves like to howl. While resting, a single wolf may start howling. The next thing you know, every wolf in the place is howling up a storm. When wolves howl, they do not always standup and raise their heads. Many times wolves will just lay on the ground and howl. Wolves like to sing just like humans like to sing. Like humans, not all wolves have a great sounding howl. Some howls are low and mournful, they may sound sad, but they are not. Some wolves have a high pitched howl and still others have a gravely sounding howl. One of the main functions of howling seems to be as and aid in assembling the pack. It is not uncommon to see a wild wolf start howling and draw other pack members to it. This can be used in dense woods to bring a scattered pack together. Wolves do not howl to start a chase. They will get together in a group to howl before they go on a hunt, this was covered above. When wolves are on a chase, that is after a moose, they are silent. howling. Howling could be like a fingerprint for wolves. is evidence that wolves can be told apart by their howl. the pack sound larger then what it really is. rush to greet them and many times a round of howling breaks out. is a language all to it's own, and one that we will probably never fully understand. ã 1998 Algiz All pages and words are my thoughts and hard work. I have tried to credit anyone whose work I have used, so please do the same for me. If I use work that I do not credit for please let me know so that I may credit those who have worked so hard. This has beautiful wolf pictures and information. Pictures, facts, resources, and more! and a recommended reading list. A collection of wolf photos and wallpaper, stories, books and videos. Learn all about wolves with Boomerwolf, an interactive website for kids. Send someone a wolf ecard! This site has some great wolf pictures! is a wonderful place to get more information on this extraordinary animal! visit the ecos.fws.gov site to search the U.S. Endangered Species List. The next time you're in Indiana, make sure you visit the Wolf Park! What are wolves saying when they howl? Take a look at NOVA's site. They even have audio files so you can hear the different wolf howls! 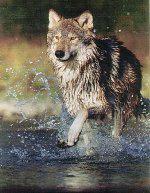 Defenders of Wildlife has a wolf journal, videos, and the Adopt-a-Wolf program. The Wolf Mountain Sanctuary has news and ways you can help save wolves. Caneman2 Hand-crafted Appalachian wooden canes are good for long nature hikes. Wolf Trust, wolf & wildlife reintroduction in Britain. Susie Gordon Wildlife Art - Great artwork by a very talanted artist!